Stravinsky is one of the most original creative musicians of the 20th century. In a career spanning six decades, he composed a glittering sequence of works of astonishing diversity, from the three, vividly colorful early Russian ballets, through the sharp wit and purity of his `neo-classical' scores and the powerful spirituality of works like the Symphony of Psalms and the Mass, to the highly individual application of serialism in the late works. A short biography of Stravinsky, with a peek at his attitude to composing religious works. An introduction to the 1930 work, commissioned by Koussevitzsky on the fiftieth anniversary of the Boston Symphony Orchestra. The non-commissioned work that had haunted him for so many years. Stravinsky, a devout follower of the Orthodox church, takes it upon himself to compose a Catholic Mass. Stravinsky's last work. Composed when he was 85, it is representative of his venture into serial music and widely considered to be the most masterly of his late works. 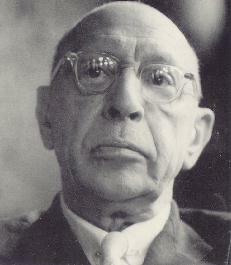 Links to sites containing information about Stravinsky and sources of classical music files. A short list of some publications that are of interest to any Stravinsky fan. A repository of the various sound clips available here. Complete works are available only in MIDI format, due to the prohibitive size of other formats and the lack of a RealAudio server. You are number in a long line of appreciative people. This site built and maintained by Victor Huang. M & u, and the numbers 1, 2, & 3. Original from the Classical MIDI Archives.